In the name of God and country and, regardless of the political cost to the New Patriotic Party (NPP) administration, the Accra Metropolitan Assembly (AMA), led by its Mayor, Mr. Stanley Nii Adjiri Blankson, will, anytime from Monday, move into Kwabenya, in the Greater Accra Region, using all lawful means, to put in place a project intended to go a long way in helping reduce Accra's monumental filth headache. According to The Chronicle sources at the Ministry of Local Government and Rural Development, the AMA Head Office and the security agencies, a team of technocrats and plain-clothed police, as well as AMA top engineers, will be “invading” the area in a once-and-for-all move to begin in earnest the controversial landfill project. The project, initially funded by the Government of Ghana and a United Kingdom (UK) grant facilitated by the Department for International Development (DFID), as well as a bank loan to be repaid with interest, included a topographical survey, climate data collection, geological and geophysical surveys, water quality surveys, road traffic, ecological and socio-economic surveys. Started since January 1999 by the National Democratic Congress (NDC) administration, the project had, in the last couple of years, been dogged with problems arising out of concerns by local residents over matters of the environment and health. An attempt by the AMA, under its former Mayor, Solomon Ofei Darko, to initiate the project was botched by angry residents who feared the project would be inimical to the health and socio-economic interest of the already poor communities in Kwabenya and its environs. The AMA, therefore, had to capitulate and go back to the drawing board, not only to muster the appropriate political will but also to address professionally the concerns raised by the residents. So much money had gone down the drain because of the delay, and The Chronicle sources at AMA and the Castle cited some £3,000,000 in grant about to slip through AMA's hands should this current effort also land on the rocks. 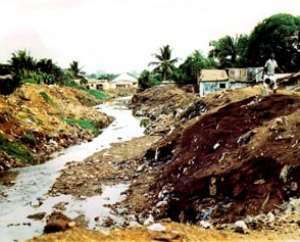 Before the initial project, some residents of the Agymankata Community who live around the proposed landfill site disrupted the work of the contractor in October 2001. This attracted the attention of Government, and the Vice President, Alhaji Aliu Mahama, and the then Local Government Minister, Hon. Kwadwo Baah-Wiredu, visited the site on November 1, 2001 to have an on-the-ground assessment of the situation, and direct continuance of the preliminary work, after satisfying themselves with the suitability of the site as a landfill. Members of the Kwabenya community or township, together with their chief at the time, expressed no objection to the construction of the landfill. A handful of developers, who have settled on the fringes of the land, however, agitated for the cancellation of the project.